What's not in either state's public plans? A third bridge across the Columbia River and a new transportation corridor. That's what's truly needed. Is this a resurrection of the Columbia River Crossing and its "light-rail project in search of a bridge"? Washington legislators said this was about "process" — there was "no specific project." Sen. Ann Rivers said this wasn't the CRC. Yet Gov. Kate Brown said "no light rail, no bridge" during her re-election campaign. Gov. Jay Inslee just remarked: "light rail must be included to get federal funding" in his budget request. Light rail isn't required for federal funding. The CRC finance plan included $400 million in federal money not tied to transit. Additional transit dollars can be obtained for Bus Rapid Transit. Metro's JPACT 2040 transportation plan spends $4.1 billion for a bridge and light rail into Vancouver, Washington. SW Washington RTC's 2035 plan includes a new bridge and light rail. What's not in either state's public plans? A third bridge across the Columbia River and a new transportation corridor. That's what's truly needed. Especially since Oregon refuses to add new through-lanes to I-5 at the Rose Quarter. Rep. Vial stated: "I ran for the Legislature originally because our transportation challenges, particularly in Washington County, have begun to become critical." 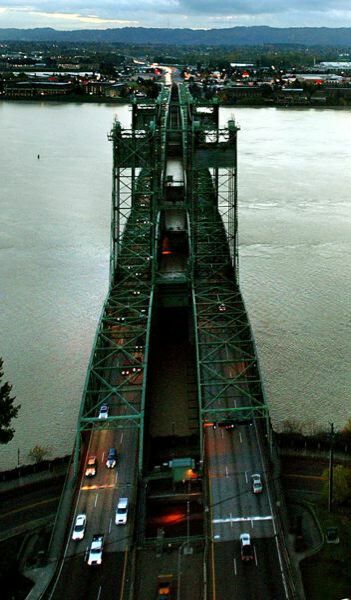 He later added: "It's not solely the I-5 bridge. There is a westside north-south solution that has been put off for roughly 38 years in Oregon." Rep. Orcutt commented: "I think what we need to be looking at is a replacement of the I-5 crossing and looking at additional crossings. I think we need to be working on it as a package. I don't think we should leave this process without a plan for additional crossings." He later said: "The math says that there aren't enough crossings; there aren't enough lanes." The Cascade Policy Institute's John Charles echoed those sentiments. "I agree that the current I-5 bridge is perhaps functionally obsolete, but I don't think replacing it or rehabbing it is a huge priority now. It is functional. I think it needs be part of a package deal. I simply reiterate the comments Rep. Ed Orcutt made and Rep. Rich Vial — you need more capacity. No bridges are going to fall down. "You absolutely need a third, fourth and fifth bridge. You should think bigger. The same reason that we have about a dozen bridges over the Willamette River in downtown Portland. They all serve different travel markets and they're all really important." The Rose Quarter has Oregon's highest accident rate. It's the region's No. 2 bottleneck, beginning at Rosa Parks Way and continuing south through the Rose Quarter. It doesn't include the Interstate Bridge.